As Ngamoko points out John P, Maori outnumbered the colonials considerably. Even using the final english draft , the littlewood document (as it is nothing more than that) the literal translation from Maori to english is still incorrect. And it appears that the littlewood document is nothing more than a copy. Thanks, John. I’ve just caught up with Ngamoko’s queries. The final draft of the Treaty was in English and then sent to Henry William who was a fluent speaker of the Maori language, to translate it into Maori so if you don’t speak the Maori language, then you just have to look at the final English draft. So how can the Queen by your Sovereign and also your Partner? With regard to the Principles of the Treaty invented by Geoffery Palmer and put into legislation in 1986, they are there for all to see. They bear no relation to the original Treaty but elaborate and create things that were not in the original Treaty. They were brought about because nothing else could be teased out of the simple Treaty but Maori were trying to gain things that just were not there, so delightful/foolish Geoffery Palmer thought he would ‘help’ them. It is the biggest con/fraud instituted upon a country ever I would say. We are forever paying for something we do not owe. Certain Maori elite are getting more and more creative by the day and our gullible spineless Government are doing their bidding – all for votes. Treason of the highest order in my view. Thanks Helen, but that is the English version you are quoting there, not the Maori version which as you say was translated by Henry Williams into Maori. Williams added words and left words out in the Maori version. For example he left out the word ‘sovereignty’ in the Maori version and replaced it with ‘kawanatanga’ and in Article 2 of the Maori version he inserted the term ‘tino rangatiratanga’ meaning Chiefly rule. It was the Maori version of the Treaty that was signed by the Chiefs, not the English version. As you can see from my earlier post Article 2 of the Maori version is very different from the English version that you have posted. Also in relation to the Treaty Of Waitangi I keep hearing about the Littlewood draft, well that’s all it is a draft and nothing more. I beg to differ with you on Palmer’s principles they are based on the 1840 Treaty, the Maori version. They only ones who are attempting to re-invent history are you and John Philips. You sound as ignorant as Paul Moon, Nicholas. Of course the draft (sp.) is not signed. It wasn’t meant to be seen by the chiefs, let alone signed. If someone as illiterate as you is going to criticise someone’s linguistic ability, I suggest you offer specific evidence if you wish to be believed. Here’s Victoria, Queen of England, in her gracious remembrance towards the chiefs and tribes of New Zealand, and in her desire that the chieftainships and their lands should be secured to them and that obedience also should be held by them, and the peaceful state also; has considered it as a just thing, to send here some chief to be a person to arrange with the native men of New Zealand, that the Governorship of the Queen may be assented to by the native chiefs in all places of the land, and of the islands. Because too many together are the men of her tribe who have sat down in this land and are coming hither. Now it is the Queen who desires that the Governorship may be arranged that evils may not come to the native men, to the white who dwells lawless. There! Now the Queen has been good that I should be sent, William Hobson, a captain of the Royal Navy, a Governor for all the places in New Zealand that are yielded now or hereafter to the Queen. She says to the Chiefs of the Assemblage (Confederation) of the tribes of New Zealand, and other chiefs besides, these laws which shall be spoken now. Here’s the first: Here’s the chief of the Assemblage, and all the chiefs also who have not joined the Assemblage mentioned, cede to the utmost to the Queen of England for ever continually to the utmost the whole Governorship of their lands. 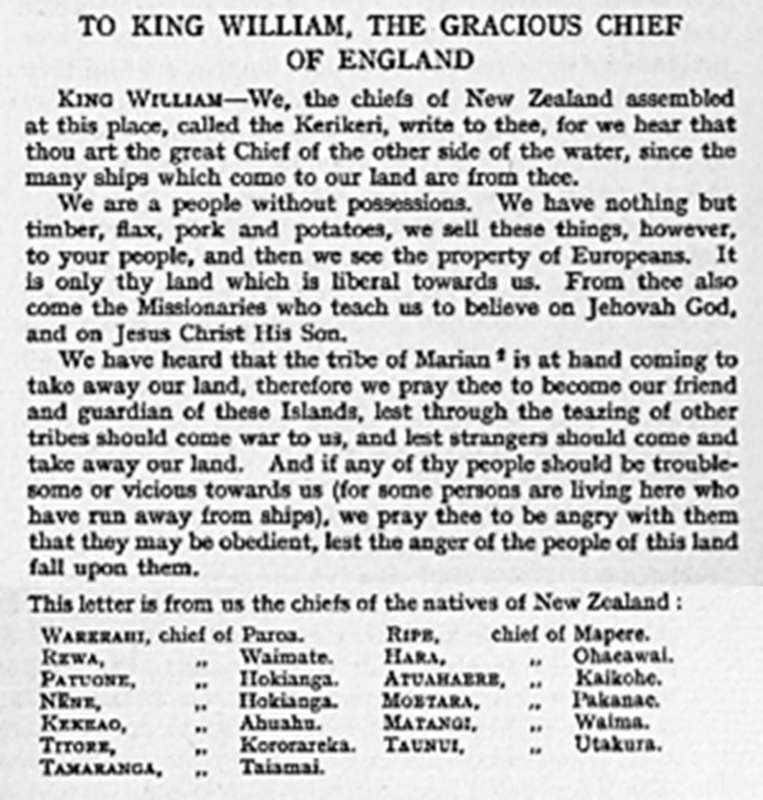 Here’s the second: Here’s the Queen of England arranges and confirms to the chiefs, to all the men of New Zealand the entire chieftainship of their lands, their villages, and all their property. But here’s the chiefs of the Assemblage, and all the chiefs besides, yield to the Queen the buying of those places of land where the man whose land it is shall be good to the arrangement of the payment which the buyer shall arrange to them, who is told by the Queen to buy for her. Here’s the third: This, too, is an arrangement in return for the assent of the Governorship of the Queen. The Queen of England will protect all the native men of New Zealand. She yields to them all the rights, one and the same as her doings to the men of England. -William Hobson, Consul and Lieutenant-Governor. Now here’s we: Here’s the chiefs of the Assemblage of the tribes of New Zealand who are congregated at Waitangi. Here’s we too. Here’s the chiefs of New Zealand, who see the meaning of these words, we accept, we entirely agree to all. Truly we do mark our names and marks. This is done at Waitangi on the six of the days of February, in the year one thousand eight hundred and four tens of our Lord. e meatiaa nei e te Kuini hei kai hoko mona. Hei wakaritenga mai hoki tenei mo te wakaaetanga te Kawaanatangao te Kuini. ratou nga tikaka katoa rite tahi ki ana mea ki nga tangata o Ingarani. the Queen as her purchase agent. give the same rights and duties of citizenship as the people of England. Thank you anakereiti for putting both versions of the TOW on this blog. Now if you doubters out there are still having trouble spotting the differences between the two versions then perhaps you need to remove your sunglasses to get a better look. I’m starting to feel like a stuck record. The English version was written because the Hobson spoke English. It was then translated into Maori by fluent speakers of the Maori language. Nothing was changed or altered and I would dearly like you to tell me where in the Maori version is the word partnership stated. So as the English version was translated into Maori. At that time it naturally would re-translate back to the English version. Any translations done after that time cannot be trusted because meanings of words change. In 1840 the English version mirrored the Maori version as much as was able given that the Maori language was rather limited. Any talk of a translation of the Maori version is different is just twaddle. So, please tell me where in the Maori version is the word ‘partnership’ mentioned. The first time is was ever mentioned was by Sir Robin Cook when he gave a judgement. He used the word ‘partnership’ loosely and when taken to task later, he said he didn’t mean it in the ‘accepted sense’. Then Geoffery Palmer invented 5 new Principles and put them into law. From then on 1000’s of claims have arisen because he stupidly said they could claim back to 1840. In the late 1800’s there were only nine claims, so how can we suddenly get 1000’s over 170 years later? No I’m certainly not reinventing history. I’m stating how it was in 1840 with the 1840 meaning of words. Our tipuna would not be happy with our people today, our minds have become so lazy we have allowed others, the very clever to control it without even knowing it, look at the great debate of 1840 thats been around since then, and still it goes on. the sad thing about our treaty is we allow ourselves to be caught up in the english version vs the maori version that we are unable to see the obvious, and if one cannot see the obvious then where do we go to have a fair say without prejudis. you see, If i am not mistaken,AND i am NOT mistaken, there is no treaty between pakeha and maori, only maori signed this document, which was witnessed by Hobson 1840 and supported by the 1835 Constitution of new zealand(the original maori version of the principles to the treaty 1840), recognised, or rattifyd into the british house of commerce and the british house of lords by none other than King William himself, the sovereign of the whenua across the water, making sure that the ways of tangatawhenua are preserved and protected. As for the principle of law, that law was repealed and englands law 1908, Queen Vic statut 1908 and the imperial application act 1988, which made way for the 1986 constitution and 5 new principles, giving the illution that the principle of law is also constructed into the new zealand governments constitution statement, which ultamitly means, history and costoms no longer has a place in this country and that the profit of a corporiate dollar comes before the rights of humanity, when the power of vote no longer counts (refer new zealand house of reppresentitives smacking law) maybe then, it is time for the outlaw, the lawless,the criminal to take their place in history once again, and lead the people away from the spawning of a dictating infiant regime, which hides itself in the shadows of democracy. If history is something to learn from then all these things that has been slapped together is an ingredient to an event heading our way. Freedom is worth fighting for, and ever 150 to 200 years humanity must rise up and fight the corpriate laws of the governing bodys to maintain and ultimitly appreciate our freedom and one another. Maybe you could help with the translation of “te Kawanatanga ” Helen, being an expert in Tiriti, especially the Maori version. Not a good idea. Better to call it something else. Best to call it exactly what it was – the last English language draft of te tiriti. So I like “Littlewood draft”. This will say exactly what you want to say, and not open the door for a bunch of oppotunist derogation of your post. There is not even a hint of ‘partnership’ in any of the words below, that someone gave above as an example of ‘implied partnership’. The law must mean what it says, and no more, or it simply ceases to be law (and boy wouldn’t I love for it to cease to be law). “Ko te Kuini o Ingarani ka wakarite ka wakaae ki nga Rangitira ki nga hapu – ki nga tangata katoa o Nu Tirani te tino rangatiratanga o o ratou wenua o ratou kainga me o ratou taonga katoa”. What ‘partnership’ is implied? In your dreams? The so-called Littlewood Treaty is the final draft. Littlewood is only mentioned because it was finally found amongst the Littlewood papers after having been lost since soon after the Treaty was signed. It is the final draft. The current one in legislation is dated a day earlier and differs markedly in several areas. Martin Doutre says it is the final draft – he would appear to be a lone voice on that one, Helen. oh except for this blog site. Just another conspiracy theory. It may have been a contract – but was never a partnership. The Treaty is anyway well overdue for being abandoned as anything other than an historical document, the validity of which was applicable only to its own time. Establishment of a democratic government in New Zealand rendered the Treaty obsolete. You are just stirring, Anakereit. We have had this conversation several times before. Martin Doutre has nothing to do with this being the final draft. Many people KNOW it is. It is dated a day later than the one in legislation and mirrors the Maori version as much as it can with a different language, whereas the one in legislation doesn’t. It was found amongst the papers of Mr Littlewood who was the lawyer at the time. As John Phillips has said it should have been consigned to history long ago. It achieved it’s aim decades ago. John Philips, you still haven’t told me what Geoffrey Palmer’s supposed 1986 ‘invented principles’ are. And Helen the Littlewood draft is just that a draft meaning it was never used. I’d appreciate that anakereiti. I definitely want to get to the bottom of this Littlewood draft document. And how do you know that Ngamoko? Kasbar I read Dr. Loveridge’s expose on the ‘Littlewood document’ and Martin Doutre’s reply. The story between Loveridge and Doutre began with the discovery of the Littlewood document in 1989 and the fact that the Littlewood document and the copy that US Consul James Reddy Clendon sent to the United States on the 20th February 1840 were indentical save for the date. The Clendon document states; “Done at Waitangi on the 6th February in the year of our Lord 1840” and the Littlewood document states; “Done at Waitangi on the 4th February in the year of our Lord 1840”. The dates are quite important. Loveridge concluded; “The briefest of inspections will show that this document is virtually identical in all aspects to the Clendon translation, aside from the date in the last line”. One can only assume that Mr Littlewood came into possession of a misdated copy of this document. The Littlewood document was positively identified by Dr. Phil Parkinson as being written in James Busby’s hand. “This translation is from the Native document and not a copy of the official document in English from which the Native one is made, and although the words may be different from what they were in the Original I think that the sense is much the same – but on the return of Captain Hobson I shall apply to him for a copy and translation of the Treaty for the purpose of sending it to the Government of the United States”. In other words according to Clendon himself the text used was simply a ‘back translation’ of the Maori text. If this description is correct, it would scuttle any idea that the English text given in the Littlewood document is the long lost English draft. Martin Doutre’s argument is that James Clendon had a hand in writing the Littlewood document so therefore is the long lost English draft. But according to Loveridge there is little evidence to support that hypotheses. And also Doutre’s argument that the Littlewood document is the long lost English draft simply falls flat in the face of Clendon’s unambiguous statement to the contrary, which Mr Doutre is unable to explain away. Doutre’s argument is further undercut by Dr. Parkinson’s forensic analysis of the Littlewood document, which firmly concludes that it is indeed a ‘back-translation’ and not the long lost English draft of the Treaty of Waitangi. Ngamoko – You say it was just a draft yet you tell Anakeriti you want to get to the bottom of the Littlewood Document. Surely it’s better you get to the bottom of it first before you proclaim what the Littlewood document is or isn’t. I encourage you to read Martin Doutre’s book. Sorry but I couldn’t find a direct link to Loveridge’s article. Ngamoko, I provided the information above because I had a feeling you might be prepared to look at more than the one side of that story. Reading Doutre’s theory, Loveridge’s critique of it and then Doutre’s reply to Loveridge is worthwhile reading. Perhaps you have done this already. The so-called Littlewood draft is the final draft which was handed to Henry Williams and his son to translate into Maori. It was from this that the Maori version was translated. It was then put into safe keeping by Littlewood who was the solicitor at the time. Sadly no-one could find it until it was discovered in his papers in 1989 but, long before, a draft dated a day earlier was put into legislation. The earlier version left out the important words ‘and all the people of New Zealand’ and does not mirror the Maori version. The final draft mirrors exactly (as far as is able given the different languages) the Maori version which shouldn’t be a surprise seeing the Maori version was translated from it. Helen, did you not read my earlier comment the Littlewood draft argument has been laid to rest it is of historical interest only, not of any constitutional importance. You don’t have any evidence to prove that it is the final draft of the TOW save Martin Doutre’s attempts to argue to the contrary against the overwhelming opinion of noted professional historians. Oh, it’s definitely the final draft, Ngamoko. It is successive duplicitous Governments who have suppressed the Littlewood draft. It was found 3 years after Geoffery Palmer invented the new Principles and put them into law. It’s a bit like the archaelogical sites which have had a moritorium put on them for 75 years. We have to force the Government to acknowledge the final draft and open the archaelogical sites. Don’t be fooled that just because the Government doesn’t want egg on its face and are suppressing things that they aren’t real. Quote the contrary. That’s why we are having racial problems, including the fraudulent settlements. Okay Helen. Can you prove that the Littlewood draft is the final draft of the TOW? Produce the evidence first before making accusations that the Government is somehow engaging in a mass cover-up. There will always be those who choose the expert opinion that best supports their preconceived points of view. Have you read Martin Doutres book? No Kasbar I haven’t read Martin Doutre’s book ‘The Littlewood Treaty’ but from what I gather it was roundly criticised by academics for his inability to prove that the Littlewood draft was the final English draft of the TOW. However, I did read Doutre’s July 2006 response to Dr. Donald Loveridge’s May 2006 expose on the ‘Littlewood Treaty’. Doutre’s explanations were imprecise and verbose. 1. US Consul J.R. Clendon’s own statement of the 20th February 1840 to the US Government where he states that what he was sending was a ‘back translation’ of the original. 2. Dr. Phil Parkinson’s forensic analysis which confirmed that it was a ‘back-translation’. Yours and Helen’s conspiracy theories fly in the face of serious academic research and your reliance on the work of an amateur historian leaves me gob-smacked. It is dated a day later than the one in legislation and has the words ‘and all the people of New Zealand’ which the earlier one omits. These words are also in the Maori version. There are no other days for a later draft. The reason the incorrect one is in legislation is because they couldn’t find the final draft. It’s been missing since the beginning and was only found in 1989. The final draft also mirrors the Maori version which the earlier draft does not. It doesn’t take a rocket scientist to work this out, Ngamoko. We posted at the same time, Kasbar, so sorry if you think I was ignoring you. Yes, Martin Doutre’s book delves into the why’s and wherefore’s in great depth so is well worth a read. I couldn’t put it better than he does. Having said that, it is totally logical that a draft dated a day later than the one in legislation and which includes all the words as well as mirroring the Maori version, unlike the earlier draft, HAS to be the final draft. At the very least it has more right to be in legislation than the current earlier draft. If anyone who doesn’t speak the Maori language wants to know what the Maori version says, they just have to read the final draft, but the earlier draft differs in several instances. Amateurs should never be discounted Ngamoko. There have been many amateurs who have revealed or discovered what academics and professionals have been unable to see. Goethe is one who immediately springs to mind, but there will be many amateurs in all fields who surpass professionals. So don’t discount an amateur just because it doesn’t suit your preferred theory. I didn’t think you’d read the book. Kasbar is right, Ngamoko. Can I suggest that you actually read the book yourself before you discount it. You may be very surprised. However, even without reading the book, I cannot understand why you don’t understand the logic of a draft a day later than the one in legislation, mirroring the Maori version of the Treaty, when the earlier one does not, actually being the final draft. It is illogical for it not to be. However, it would be so much better if you read Martin’s book before you say we are conspiracy theorists. After that, it’s up to you. That the “Littlewood” draft is the final one in English has been established beyond reasonable doubt. The main (but not only) facts are: (1) Written by Busby (2) on the US Consul’s notepaper and (3) dated 4th February 1840 – later than any other pre-signing English draft. Leaving everything else aside though, the inescapable fact is that it is virtually identical to the Maori Treaty which was signed on 6th February. You cannot say that for any other known English version. Other writers have come to the same conclusion, in addition to Martin Doutre. It is only Donald Loveridge who attempts to cast doubt on it by very unconvincing reasoning – and Claudia Orange sits on the fence. The real significance is that it – AND the signed Maori Treaty – omit any reference to forests, fisheries or partnership – thus nullifying settlements made to Maori groups based on an incorrect English draft of the Treaty. If not for that misuse of the “Treaty”, authenticity or otherwise of Littlewood would be just an interesting historical fact, with no real application to modern day events. “That the Littlewood Draft is the final one in English has been established beyond reasonable doubt”. “that it is not a copy of the Official Document from which the Native one is made”. And further Clendon wrote; “but on the return of Captain Hobson from the Southward I shall apply to him for a Copy and translation of the Treaty”. The Littlewood document and the Clendon document are virtually identical save for the date – Littlewood document is dated 4th February 1840 and the Clendon document is dated 6th February 1840. And one more nail in the coffin that the Littlewood document is the final English draft of the TOW is Dr. Phil Parkinson’s forensic analysis which firmly concluded that the Littlewood document is a ‘back-translation’. The overwhelming evidence concludes that the Littlewood document is not the final English draft and is of historical interest only, not of constitutional importance. BUT ON THE RETURN OF CAPT. HOBSON FROM THE SOUTHWARD I SHALL APPLY OFFICIALLY FOR A COPY AND TRANSLATION OF THE TREATY FOR THE PURPOSE OF SENDING IT TO THE GOVERNMENT OF THE UNITED STATES’. (See despatch No. 6, Auckland Institute and Museum Library: Micro # 51. Despatches from the U.S. Consul to the Bay of Islands and Auckland, 1839-1906: Roll 1, May 27, 1839 – Nov. 30, 1846, also available at the University of Auckland Library). You’ve got to realise what document Clendon was talking about. He was referring directly to the piece of paper, in his own handwriting, that he sent to the US Secretary of State, John Forsyth, on the 20th of February 1840 in despatch number 6. The entire despatch content is shown in my online book at: http://www.celticnz.org/TreatyBook/Chapter11.htm ). 1. The final drafting session was at Clendon’s Okiato mansion on the 4th of February, 1840 (that’s why Clendon’s unique stock of W. Tucker 1833 paper was used, by James Busby, for writing the Littlewood document). 2. Clendon, in his capacity as US Consul obviously made his own copy (on his own W. Tucker 1833 paper stock) at the same time and it’s essentially word-for-word the same as the Littlewood document (except for some capitalisation and the date, which Clendon must have added after the treaty became a reality on the 6th). 3. As a loyal Englishman, Clendon would have been aware that his transcript was to be held in confidence until after the events of the next few days. 4. When Clendon sent his handwritten transcript to the United States on the 20th of February 1840 he stated it was not the actual document from which the Maori translation was made, WHICH IT WASN’T, as what he was sending was only his own transcript of the final draft dated the 4th of February 1840. 5. However, on the 17th of February he had received a printed copy of Te Tiriti and Hobson’s two printed Proclamations from the CMS Mission printer, Colenso. As a seasoned Maori speaker and close friend of Chief Pomare II, Clendon had co-signed the Treaty in behalf of Pomare II that same day, probably acting as the interpreter. 6. As a seasoned Maori speaker, he would have been able to state with confidence to US Secretary of State, John Forsyth, that the wording on his 4th of February transcript represented a “translation of the Native document”, which it clearly did. 7. Clendon seems to have assumed that there would be an “official English treaty text” printed and issued, but did not yet know what its exact wording would be. The Americans would, ultimately, need that exact wording in their records as a legal text. 8. After Clendon had made his transcript on the 4th, the Final English Draft was still “a work in progress”, as it yet had to be scrutinised and approved, as to the choice of wording used, by the designated translator, Reverend Henry Williams (who was not present at the final drafting session). ‘The task of translation was necessarily a difficult one, it being essential that there should be a complete avoidance of all expressions of the English for which there was no equivalent in Maori’ (see The Treaty of Waitangi, by T.L. Buick, pg. 113). 10. Williams, in conjunction with Busby, had consulted with Hobson the day before the final English draft was written. Williams is here (above) stating that the final English draft was subject to change if any of the wording was deemed to be untranslatable or if no equivalent sense of meaning could be exactly conveyed (any ambiguity). 11. Changes to the treaty wording were going on until the last minutes before presentation on the 5th, wherein Busby asked for a word substitution to the Maori text. 12. Bishop Pompallier disrupted the meeting on the 5th and asked for guarantees related to the continuance of religious freedom. These assurances had to be publicly given by Hobson. They are nowadays sometimes referred to as the “4th Article of the treaty”. Clendon, who was in attendance, would have been quite justified in concluding that this might lead to another addition to the “official English” text. 14. So, what Clendon does not know for certain at that moment, he promises John Forsyth he will find out and, moreover, he will acquire the necessary goods directly from Hobson and send those “official” texts, both in English and Maori, to the Government of the United States. 15. Clendon, in his official capacity as US Consul, then made application to the Colonial Secretary for the official “copy and translation”. Hobson didn’t get back to the Bay of Islands till the 6th of March, totally paralysed by a stroke. He was carried on a stretcher to the home of Reverend Davis at Waimate. 16. On the 11th of March Clendon was visited by Surveyor General, Felton Matthew and Hobson’s private secretary, James Stuart Freeman. 17. On the 13th of March Clendon was revisited by Felton Matthew, who had “some business to conduct”. 18. On the 25th of March, Clendon sent a RECEIPT LETTER to the Colonial Secretary, Willoughby Shortland, acknowledging that he had received the requested items, which consisted of the Final English Draft and a beautifully handwritten copy of Te Tiriti penned by Reverend Henry Williams himself. 19. On the 29th of March 1840, US Commodore, Charles Wilkes arrived at the Bay of Islands in USS Vincennes. On the 2nd of April he applied to US Consul James Clendon for the treaty texts in English and Maori. 20. One the 3rd of April 1840 Clendon supplied Wilkes with the official materials he’d received from the Colonial Secretary and Wilkes made two transcripts of the English text supplied. One of these was for his despatch No. 64 to his superiors and the other was written into the USS Vincennes letterbook as a permanent record. 21. It is absolutely beyond any dispute that the document transcribed by Wilkes was “THE LITTLEWOOD TREATY”, as Wilkes religiously copied even the spelling mistakes or, where a word was crossed out in the Littlewood text, Wilkes wrote the word and crossed it out, etc. 22. Clendon later retained the “official” treaty documents he’d been supplied and never gave them back to the Colonial Secretary. The handwrtten copy in Maori resides amongst the Clendon House Papers to this day. 23. Clendon’s solicitor was Henry Littlewood, whose papers were retained for many generations by his progeny. In 1989 Henry Littlewood’s great-great grandchildren found the final English draft document, the one that went missing from the Clendon House papers. Among the Clendon House papers are receipts signed by Henry Littlewood for legal conveyancing work undertaken by Littlewood for Clendon. 24. So, in conclusion, Clendon “officially” requested the finalised texts in both English and Maori. He was supplied them “officially” by the NZ Government. He wrote an “official” receipt to the Colonial Secretary. Wilkes later “officially” requested the two finalised texts from Clendon. US Consul Clendon “officially” responded by letter and supplied the “official” documents to Wilkes. The “official” English text was then transcribed twice. The USS Vincennes letter book, which contains the “official” English text now resides in Topeka Kansas and can be viewed on microfilm 1262, pp. 142-145 & 163-168 (covering Wilkes’ Despatch 64) at the University of Auckland. But, at an earlier era when our leading treaty historians were allowed to express logical conclusions about the true status of the Littlewood document, based upon the extant evidence, they made public statements in support of the fact that the Littlewood document was a pre-treaty “draft” (the final English draft that existed one day before there was a Maori translation in existence). ‘Although nothing can be proven I think that what Hobson read [at Waitangi on the 5th of February 1840] was not the “Her most gracious Majesty . . .” text (which has a rather stiff and formal preamble) but rather the simpler and less formal Littlewood one “Her Majesty Victoria . . .” ….. Dr Orange, in a document of 5 October 1992, considered that Dr Loveridge was “probably correct” in deducing that the Littlewood document was “a translation of the Maori treaty” but what Loveridge said was that the “translation from the native document” and “the Maori version on which it was based” both bore the date of 6 February (rather than 4 February). But this is not really satisfactory. The Busby / Littlewood document of 4 February is not a translation of the Maori text of the treaty because that translation was written on 5 February, by Henry Williams.’ (see: Letter response from Dr. Phil Parkinson to Martin Doutré, 25507 Doutre, AT 13/19/4, 24th of December 2003). 3. ‘Archivist and historian Graham Langton said the Littlewood Treaty had “no status whatsoever” but unlike Dr. Parkinson’s view, said it was “very likely” it was documentation from before the signing of the treaty on February 6. Mr. Langton said “it was probably a draft version and it was possible it was the final draft but added: So what?” (see National Business Review, pg. 13, March 4, 2005). 4. ‘I agree that the Littlewood document is dated 4 February 1840, and that there was almost certainly no subsequent drafting of the Treaty’s English text’ (See excerpt from Dr. Paul Moon’s letter to treaty researcher, Ross Baker, 30/08/2004 and posted onto the O.N.Z.F. website). 5. ‘On 30th March, US Commodore Charles Wilkes, Antarctic explorer, arrived in the Vincennes to join his other ships Porpoise and Flying Fish. Damaged after their bruising exploration of the icy land, they reprovisioned and repaired their ships till late April. As he left Clendon gave him a further despatch containing a hand-written copy of the Treaty in English copied from Busby’s copy of the final draft. It is believed that Clendon then retained Busby’s copy of the Treaty’ (see The Treaty and Its Times, by Paul Moon & Peter Biggs, chpt. 9, pg. 213). So, our so-called treaty experts are on record from as early as 1992 as accepting that the Littlewood document existed before the Waitangi assembly of the 5th of February 1840 and, over the years, the evidence has mounted, not lessened, in support of that unassailable conclusion. With all due respects Martin after having read your post until your position regarding the ‘Littlewood Draft’ is scrutinised and endorsed by the academic world it will remain largely ignored. one is the major role you have ascribed to US Consul J.R. Clendon in the drafting and production process of the Treaty of Waitangi. You contend that much of that process was carried out at Clendon’s home but a contemporary account from the Rev. Richard Taylor states that when he arrived at Clendon’s home on the afternoon of the 4th February none of the major participants of the treaty drafting process were there. And 4pm was the exact time that Hobson handed over to Williams the English draft for translation into Maori. In fact in Prof. Rutherford’s pamphlet ‘The Treaty of Waitangi and the Acquisition of British Sovereignty in New Zealand, 1840 (1947) he makes no mention of Clendon’s role in the preparation of the Treaty. ” is not a draft of the Treaty nor is it a ‘copy’ of it. it is simply a translation of the Maori text of the Treaty….The paper on which the Littlewood document is written has a watermark(W TUCKER 1833) which is also found on other documents prepared by Clendon…including despatch number 6, first page …and it is possible, and even probable, that Busby wrote the translation during a visit to Clendon in the period 17-20 February…using Clendon’s paper stock”. So, Martin there you have my reasons for not accepting the Littlewood Draft as the final draft of the Treaty of Waitangi and unless some noted academic endorses your hypotheses on this subject then it will stay out there in the wilderness. If my memory is correct Ngamoko, you’re in Dubai, so I think your last post has crossed Martin Doutre’s reply to you which I think you’ve not yet read. Thanks for that Ngamoko ….. but can you please explain what you mean by “not of constitutional importance” ? Steve, what I meant by “not of constitutional importance” is that NZCPR has stood by the claim that the Littlewood draft is the final English draft from which the Maori text is derived from so therefore according to their logic Maori have no legitimate cause for redress for past injustices. If I’m correct that the Littlewood draft is not the final English draft then it blows NZCPR’s rather spurious campaign against Maori clean out of the water and is therefore of historical interest only. I’m just curious because I’m not aware that the TOW has ever been “of constitutional importance”. Thanks again Ngamoko …. but NZCPR’s “rather spurious campaign against Maori” is irrelevant. I’m not interested in NZCPR. With all due respect …..you haven’t answered my question. Why is the Littlewood document not “of constitutional importance” ? Not at all Helen but Ngamoko might be ignoring Martin Doutre, don’t you think? Is it just me – or is this all getting sillier by the hour ? How the f**k can a document dated 4th Feb. 1840 possibly be a ‘back-translation’ ?? There is very little doubt in my mind – and the minds of many others who have bothered to look at the evidence with open minds – that the “Littlewood draft” is the final one – from which the Maori version was translated. Forget every other point – the simple and prevailing fact remains: IT IS IDENTICAL TO THE MAORI TREATY WHICH WAS SIGNED !!! That is all that matters. Ngamoko obviously doesn’t want to know. He can’t accept the reality about the Littlewood Treaty so just pours scorn on all the facts placed before him. Martin, thank you for your very explicit reply. No-one can doubt the true facts after what you have said, unless they just don’t want to believe them as appears to be the case with Ngamoko. Read Martin’s book Ngamoko and then you will be in no doubt. Helen you sound like a religious zealot. Its quite creepy. Ngamoko – your last quote from Parkinson is irrelevant because it contains nothing other than an opinion, which is fine, but you seem to use that quote as if it contains some proof to support your view. Really, the root of your argument is that you intend to believe what the ‘noted academic’ has told you to believe and will do so until a “noted academic’ tells you to believe something different. It’s a very flat-earth way of looking at things that deserves not just one of John’s eyepatch awards but a complete blindfold. Btw , I appreciate you are about the only person around here who argues the opposite view to the majority in such a civil way – Thanks, it’s great to hear what you have to say. Good morning Ngamoko ….. I agree with Kasbar in regards to the dignified manner in which you present your opinions. Good on you. Ngamoko re the question I asked yesterday requesting clarification of your statement that the Littlewood document was of “no constitutional importance”. Your lack of a response would suggest that you actually DO see the Littlewood document as having significant constitutional importance given the present move by the Maori Party to have the TOW “enshrined” into the NZ constitution. Any recognition of the validity of the Littlewood document would quickly derail the gravy train and send the Maori Party’s constitutional agenda and objectives spiralling down the drainhole. You’re the first person I’ve seen on this blog to associate the Littlewood document with “constitutional importance” ….. and since the TOW presently has no constitutional importance I have to conclude that your stand in rejecting the Littlewood document has more to do with Maori constitutional aspirations than the pursuit of the truth. Good morning to you Steve, thank you for your comment. I am only pursuing this issue because I want to get to the truth. I have noticed on other forums where Mike Butler of the NZCPR has taken a keen interest in the Littlewood Document. I have kept asking myself why? I have come to the same conclusion that you have highlighted in your post. I am wondering if you could tell me the source of you printed copy of the 1831 petition? I have only been able to locate the original handwritten copy, but would like a digital file of the printed version.